Dual commentary is available in the downloaded video. 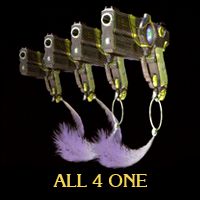 Four powerful handguns, crafted by the famed demon-smith, Rodin, and crowed with the names Athos, Porthos, Aramis and D'Artagnan. Pushing one's magical powers to their limits, these guns' rate of fire and stopping power are incredible. 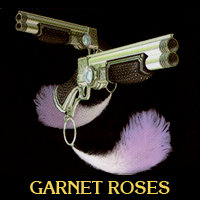 Shotguns containing the souls of fairies known to collect the Garnet Roses that bloom only in Inferno. Each shell fired from the guns contains the curse of the fairies' trapped souls. A katana born in the unknown depths of Inferno, brimming with mystery. One legend states that it is the twin sword to Shuraba. It is also said the sword's name comes from the story of a witch who loved the sword, and was excommunicated for carrying out a futile war against the angels. 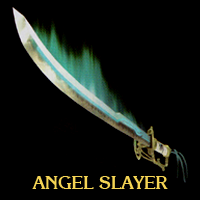 While the sword did not contain the soul of a demon, the Angel Slayer displayed incredible power; however, the sword, and the witch in whose hand it was held, both found themselves in Inferno. Eventually, the blade passed into the hands of Rodin who was able to make up for its previous deficiency; however, it remains unknown what sort of demon the smith was able to seal away in the historic blade. 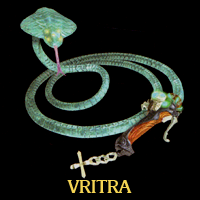 A possessed whip, sealing away the soul of the ancient serpentine demon Vritra. Summoning the power of the demon from a portal on the weapon's hilt, it can be used in the same manner as a normal whip. 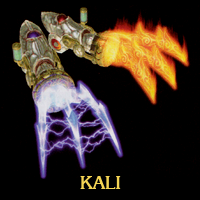 The soul of Kali, said to be a demon with a thousand arms, is imprisoned within these razor sharp claws. From the portal at its hilt, the weapon can summon two types of arms, fire and lightning, to bear against enemies. Cursed to dance endlessly, Karen, banished to the icy hell of Cocytus, now finds her soul sealed within Rodin's handiwork. 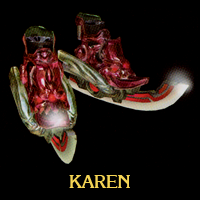 The blades of these skates are able to release incredible cold, giving those skilled in leg techniques frightening power; however, those without the power to fight the curse will find themselves losing control of the skates and dancing endlessly until their death. A grenade launcher containing the soul of Col. Slade, a man who traded his eyesight to a demon to save his troops, only to be deceived by the hellish denizen and find himself consigned to Inferno. 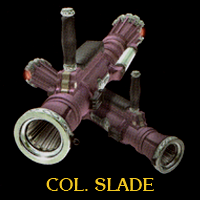 Each shot fired from the launcher's tube is filled with Col. Slade's endless malice. 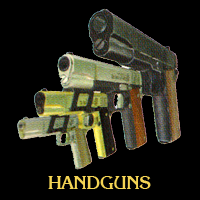 Automatic handguns produced by Rodin. These weapons are unable to withstand the intensity of magic-imbued bullets or melee attacks. Those capable of such feats must be careful in holding back their full power. The true name of Jubileus, as recorded in myth, is actually constructed from unutterable syllables. This is because humans remain incapable of capturing her true glory, as she is the total embodiment of Divine Will. Humanity, bound to the physical world, was forced to depict and describe her in its own tongue. It is supposed that humanity selected the name Jubileus, taken from the word Jubilee, meaning celebration or rejoicing, in an attempt to turn Divine Will into worldly happiness via repeated recital of her name. As a result of the cataclysmic events of the ancient First Armageddon of which she sat at the very apex, Jubileus was forced into dominion over the world of Paradiso, governor of the light amongst the Trinity of Realities, and put into an endless slumber. It was from this point that the forces of light and dark began their endless battle for hegemony. 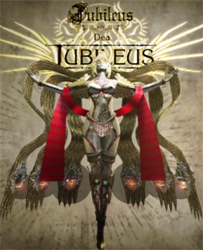 The resurrection of Jubileus will trigger a reunification of the Trinity of Realities, fulfilling the desires of not only the forces of light, but also a centuries-old prayer said by those seeking divine intervention. Queen of the River Styx, the boundary between humanity and Hades, Madama Styx is said to be a moth living within the human world. These insects, born from the magical power that flows from a woman's body, are charged with luring the souls of sinners into Inferno. 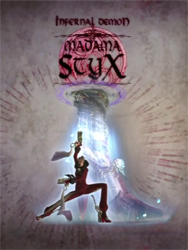 By trading their soul to Madama Styx, one is able to obtain great power and knowledgeable counsel. 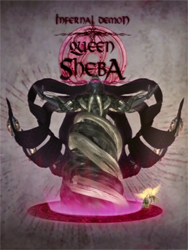 When the cosmos was split into light, darkness and chaos in between, the incredibly powerful Sheba was born alongside the darkness controlling world of Inferno. As she lives in the hellish land, and is often classified as a demon; however, the full details of her existence are unknown.